CALL TO ACTION: Attend Benicia City Council on Tuesday, July 17! Come support an Industrial Safety Ordinance at Benicia City Council on July 17 at 7:00 p.m. This is a chance for the City Council to have staff review a proposed ordinance and move forward with making sure that Benicia has a seat at the table when it comes to safety. An Industrial Safety Ordinance (ISO) would ensure that Benicia has a network of air monitors, and a robust emergency response plan. Benicia is the only refinery town in the Bay Area without an ISO. The Council will be reconsidering their decision to kick the can down the road. Councilmembers Schwartzman, Hughes and Campbell voted at the last hearing to postpone this important decision until after the November election, while Patterson and Young wanted to move forward now. This is a chance for them to get it right. If you can’t come, please email (see below). Benicia Independent – send to Roger at rogrmail at this URL. SPOKANE, Wash. – Three grandmothers were charged for obstructing a train on Wednesday. The three are known as the “Raging Grannies.” They blocked BNSF train tracks in protest because they want Spokane to stop oil and coal trains from going through downtown. The grandmothers said they tried to talk to city officials about fossil fuels and fracking but when that did not work, they decided to protest. “Even one person can stop a train it’s very easy to stop a train,” Raging Grannie Deena Romoff said. 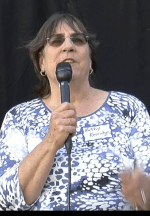 Romoff and the other two “Raging Grannies” wrote letters and tried to get the Spokane City Council to stop oil and coal trains from going through downtown but the measure failed. “People are getting frustrated that our government is not doing anything, that the world isn’t doing anything,” she said. Romoff and several others decided to take matters into their own hands. “When you have one city along the track that says ‘you can’t come through here,’ what happens? It stops,” she said. BNSF railway officials said the protest group stopped 11 trains, one was fully loaded with coal. “Even for that short period of time it gives us that much more time on this planet in my looking at it,” Romoff said. The “Grannies” said their time behind the bars will not be in vain. They said they are joining forces with other environmental protests across the country and will go out every day if they have to.